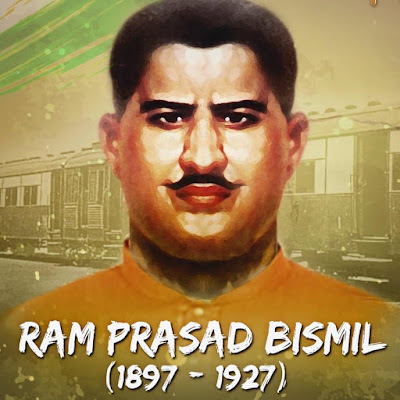 Ram Prasad Bismil was one of the great freedom fighter, who was involved in the historic kakori train robbery. He was born in 1897 at Shahjahanpur, Uttar Pradesh. Son of Murlidhar and Moolmati . His father Muralidhar was an employee of shahjahanpur municipality. Ram prasad bismil learnt hindi from his father and was sent to learn urdu from moulvi. He wanted to join an English medium school and admission in one of such school despite his father's disapproval. Ram Prasad Bismil joined Arya Samaj. He was also very talented in writing poetry. All of his poems have the intense patriotic feeling. Ram Prasad Bismil always wanted to see india as a free nation and dedicated himself to the cause of the country. Ram Prasad Bismil team members consisted of great freedom fighters like Chandra shekhar Azad, Ashfaqulla Khan, Bhagawati Charan, Rajguru and many more. Ram Prasad Bismil used to take advices related to religion and politics from great patriot and intelligent Swami somadevji. The Practice of Brahmacharya inspired him alot and he became an ardent follower of it. He got himself engaged in the volunteering of Shahjahanpur Seva Samithi. In order to get people's attention, he published a pamphlet named “A message to my countrymen". Yogic Sadhana of Rishi Aurobindo was translated by Ram Prasad Bismil. All of his works were published in the series of "Sushil Mala". He wrote his autobiography while he was in the jail. Hindustan Republican Association - In 1928, Ram Prasad Bismil along with Bhagat singh, Chandrashekhar Azad and others, laid the foundation of Hindustan Socialist of Republican Association (HSRA) at the Feroz shah kotla, New Delhi. The constitution of the party was drafted by Ram Prasad Bismil in 1923. Kakori Conspiracy - Ram Prasad Bismil and his men attempted to rob the treasure of the government being carried in a train at kakori near lucknow on 9th August 1925. The attempt was unsuccessful and ended with arrest of 40 revolutionaries. Except the chandra shekhar azad, After Ram Prasad Bismil along with others were given capital punishment. The Great Freedom Fighter of India was executed on 19th December, 1927. On 28 January 1918, Ram Prasad Bismil published a pamphlet titled Deshvasiyon Ke Nam Sandesh (A Message to Countrymen), which he distributed along with his poem Mainpuri Ki Pratigya (Vow of Mainpuri). Ram Prasad Bismil Udyan is near Rampur Jagir village, where Bismil lived underground after the Mainpuri conspiracy case in 1919. In February 1920, when all the prisoners in the Mainpuri conspiracy case were freed, Bismil returned home to Shahjahanpur, where he agreed with the official authorities that he would not participate in revolutionary activities. In 1921, Bismil was among the many people from Shahjahanpur who attended the Ahmedabad Congress. 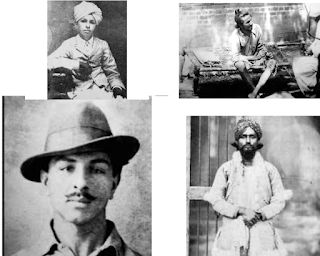 With the consent of Lala Har Dayal, Bismil went to Allahabad where he drafted the constitution of the party in 1923 with the help of Sachindra Nath Sanyal and another revolutionary of Bengal, Dr. Jadugopal Mukherjee. Bismil was hanged on 19 December 1927 at Gorakhpur Jail, Ashfaqulla Khan at the Faizabad Jail and Roshan Singh at Naini Allahabad Jail.